I have an embarassing confession. 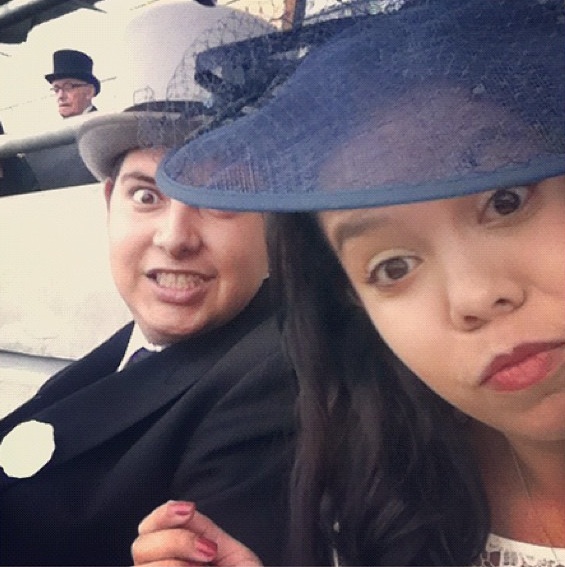 Today, my sister Amy – a racing novice picking selections based on novelty reasons – managed to do better than me with her selections for Royal Ascot. I decided my mother and sister, currently in London, should experience Royal Ascot once in their lifetime. It finally came to fruition today, with the three of us taking our places in the Royal Enclosure. For fun, I got Amy to give me her tips. Selecting the one runner in each race, she managed to nab one winner to my blank sheet. Also, her runners on the whole did better than mine. It makes me feel quite the fool! Looking back at her tips (and the reasoning behind her tips), it makes me wonder whether I’m heading into the right career if I can be so easily out-tipped! Here, I look at each race and examine our selections. In the Norfolk Stakes, we both liked Cay Verde, the mount of Australian jockey Craig Williams. She liked him because it had Williams on board, I liked him because the form had held up through Hototo and Dylanbaru. Alas, it was not to be as he finished sixth to the extremely wayward Reckless Abandon. We were on even terms after Race 1. The Ribblesdale Stakes, a race I was genuinely looking forward to, turned out to be a shocker for me. I was keen on Momentary, owned by Her Majesty The Queen, after a gutsy win in an Oaks trial. Amy liked Twirl, because she was a fan of Twirl chocolate bars – and because her silks (those of Derrick Smith) resembled the packaging of a Twirl bar. Momentary, after stumbling early, was virtually eased out of the race and finished a distant 12th. Twirl, on the other hand, was backed heavily in the ring but could only manage fifth. Still, Amy had one up on me because Twirl finished in front of Momentary. Race 3 was the feature, the Ascot Gold Cup, and Amy was most keen on Colour Vision. The reason? She thought his name was ironic, given he races in the royal blue silks of Godolphin. Hardly colourful. As for me, I was in the corner of the favourite Fame and Glory. I thought, based on his win last year, he’d be incredibly hard to beat. But this year was a different story. Fame and Glory was struggling with two and a half furlongs to go while Colour Vision ambled up. He held off the challenge of Opinion Poll to make it a great day for Godolphin – or more importantly, a great day for Amy. Fame and Glory finished seventh. And so, not only was Amy ahead 2-0, she also had a winner over me. That was something I could not claw back over time. With 30 runners in the Britannia Stakes, I thought before the meeting that this would be Amy’s best chance to beat me. And so it proved. Amy liked Hamza as her jockey’s name was also Amy (Ryan). I liked Prince Alzain after his very good third at Epsom. But while Prince Alzain floundered, a well beaten 18th, Hamza led gamely from the front, only fading the last furlong and a half or so to finish 9th. And so, with four races down, Amy had me beaten. She held a 3-0 lead, and I couldn’t catch her. At least I got redemption in the last two races, even if they couldn’t win. In the Tercentenary Stakes, my Tales of Grimm finished 5th after some solid performances in recent times. Amy’s Cavaleiro, whom she fancied because the silks were two shades of her favourite colour (purple), finished 8th. And in the final race of the card, we had the two favourites – I had Nicholascopernicus, while Amy was keen on Gabrial The Great (because his silks, those of Dr Marwan Koukash, indicated he was a star. They didn’t run like favoured runners, with Nicholascopernicus (9th) only just scraping in ahead of Gabrial The Great (11th). In the end, Amy held a 3-2 advantage over me. What does this say? Well, perhaps Amy had beginner’s luck. But it also shows the unpredictable nature of horse racing, definitely around the major carnivals. It’s probably not the best thing to admit publicly, but I’m always accountable for what I post and I cannot believe how much better my non-racegoing sister did when compared to me! Oh well, there is always tomorrow to find a winner!! !